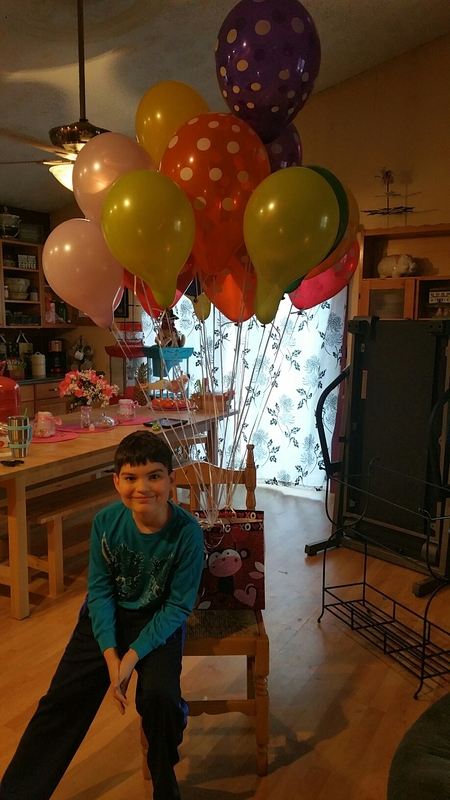 Jake’s school had their class party on the 17th, and he went through several ideas before settling on a floating Valentine’s Day Bag to receive all his valentines from his classmates. We tried the Dollar Tree, but we got up to 15 balloons, and they still wouldn’t lift the basket so we headed to Walmart and bought a helium tank and four packs of balloons. Ted and I were up at 6 a.m. to blow the balloons up and tie them to the gift bag – and it worked! We added a few extra in case some popped. In total, we had 22 balloons on the gift bag, and it floated all the way to the ceiling! Jake loved it, and we had enough time to figure up how much it would cost to tie enough helium balloons to him so he could float (for the record, it was over $1500). Now THAT was a fun math lesson, and he was totally absorbed in figuring it out (I let him use a calculator to run all the equations). All the students made positive comments to Jake when he went in the building and down the hallway with it that morning of the party. His teacher was even impressed (especially about the math problem part). At the end of the day, he snipped off almost all of the balloons and gave them away to his classmates. That made it super easy to get home!